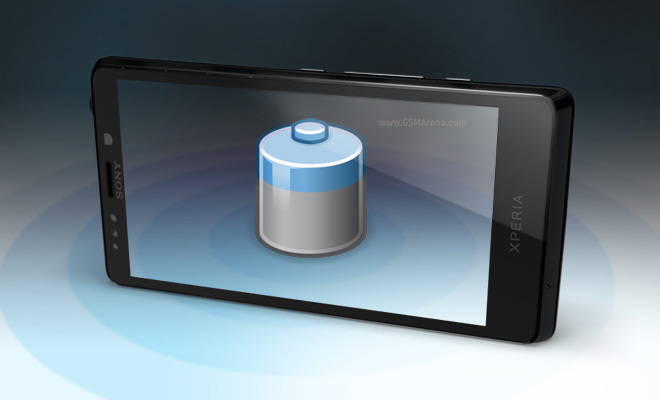 The Sony Xperia T features a 1850mAh battery, which is one of the biggest we’ve seen in a Sony smartphone. Remember the 1305mAh batteries in a few fairly recent Xperias? Yeah, that wasn’t enough. As far as talk time on a 3G network goes, Sony rated the Xperia T at 7 hours, but in our test the phone went on to 8 hours, which isn’t record breaking, but still quite good, considering that normally Xperias don’t do well on this test (the T is among the better scoring ones we’ve tested). The Sony Xperia T web browsing endured 5 hours and 33 minutes of our web browser test before its battery went flat. The Xperia T fell a bit short of the time set by the Xperia ion LTE but it did narrowly beat the Xperia acro S, both of which are Snapdragon S3-powered and have similarly sized batteries (note that we run our browser tests over Wi-Fi). The video playback test ran the battery dry in 6 hours, which puts the Xperia T in the middle of our charts. This time is on par with the Xperia ion and just a bit better than the Xperia acro S, showing that this test is dependent on the screen more than the chipset. In the end, we arrive at an endurance rating of 36 hours. This is the time between charges assuming you do an hour of calls on a 3G network, watch video for an hour and then browse the web for another hour every 24 hours. 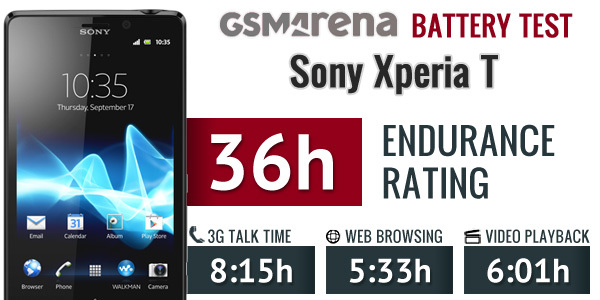 The endurance rating is coincidentally the same as the one we got for the Sony Xperia acro S and better than the 31 hours the Xperia ion LTE got (that one had poor talk time performance).